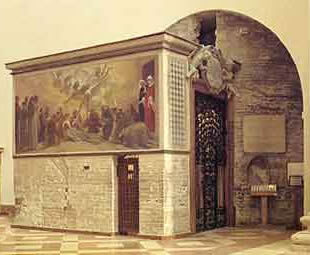 The Porziuncula is a good symbol of Francis’ revolutionary impact on the church – though the word “revolutionary” might not be the most precise. Contrary to revolutions that change regimes or constitutions, Francis led a revolution of the identity and essence of the church. And because this revolution happened in and with the church, it may be better called a “reform.” Two important revolutionary reforms that still affect the church today are the basis for authority and the basis for individual rights. Drawing on Augustinian thought about the ‘two cities’ and on the Aristotelian influence regarding the ‘nature-grace’ duality, medieval theologians spoke of two distinct realms that wield authority: the sacral (spiritual) and the political (secular). The church held that spiritual authority (for example, theories and claims to justice) had to have priority over secular authority (for example, the application of justice). In Francis’ day, the basis of authority for both realms was property. In the sacral realm, the Pope, it was claimed, owned all property, not ‘in particular’ but ‘universally’; we might say, all property rights that others exercised were grounded in his authority. The chain of equivalences that legitimized authority went like this: property meant power; power meant jurisdiction; jurisdiction meant authority; and authority meant a determinative role for the church in shaping society under the law of Christ (O’Donovan, The Desire of Nations, 206). Franciscan friars confronted Papal authority with the possibility of absolute poverty. This provoked some intense questioning of what it meant to possess ‘spiritual authority’. The threat which the Franciscans posed to current doctrines of the papacy was far more serious than that vague discomfort which poverty always poses to wealth. By vowing to poverty, Francis subverted the traditional claims to authority, which risked unraveling the whole garment of Christian society. Out of the long controversy came an attempt to articulate a different concept of spiritual authority, one based on the authority of the word. This was the work of the imperialist theologians who took up the Franciscans’ cause. Their role was, of course, ambiguous, serving at the same time the church’s interest in recovering a truly spiritual authority and the secular rulers’ interest in having an uncontested field. Their most important contribution lay in the principle that a word of Gospel truth has its own distinct authority, different from the authority of threat or command (O’Donovan, The Desire of Nations, 207). In this, it is easy to identify Francis’ influence on the Reformation. Ultimately, the authority promoted by Francis was not rooted in word but in God, God who communicates to humanity not only in human language but also in human flesh. He who, though he was in the form of God, did not regard equality with God as something to be exploited, but emptied himself, taking the form of a slave, being born in human likeness. And being found in human form, he humbled himself and became obedient to the point of death—even death on a cross. Therefore God also highly exalted him and gave him the name that is above every name, so that at the name of Jesus every knee should bend, in heaven and on earth and under the earth, and every tongue should confess that Jesus Christ is Lord, to the glory of God the Father (Philippians 2:6-11). Francis grasped that this high authority, as Jesus shows us, is revealed at the bottom. Following this authority, Francis sold his possessions, begged his bread, and, with the stigmata on his hands and feet, he died naked on the ground at the Porziuncula.